Baby on board signs with a personal touch. Choose from one of our many templates by browsing our categories, or complete our online form and have us design something bespoke for you! These are great presents for children, parents, grandparents or even yourself. We have over 150 templates that can be customised, but if you have something specific in mind, let us know and we'll draft it up for you to see before purchase! A beautiful baby boy on board car sign, with baby in a blue t-shirt and nappy for your special li..
Our best selling princess sign. This crown is by by far one of our customer's favourites. Looks grea..
Captain Jack Sparrow on board. 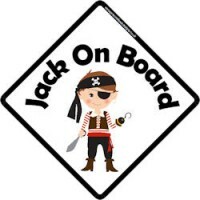 This is a great pirate on board car sign, complete with hook and eye ..
What does every girl love? Shoes! 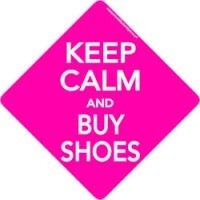 A keep calm and buy shoes car sign - a perfect girl for any girl!.. Every boy loves big manly diggers! 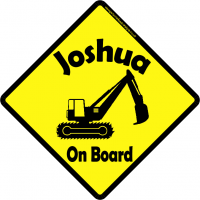 This sign is fantastic for the little workmen, in a traditional..
Browse the categories section on the left to view the signs we have for you, please remember, if you don't see what you are after, we can create it for you. 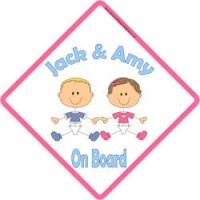 Create your own baby on board car sign. Complete our online form, choose your own colours, text, pictures or even upload your own photo. We will then draft you a design, and provide you with details on how to purchase. 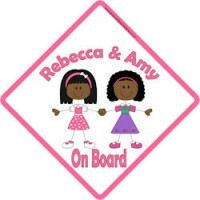 Baby on board signs, aimed at young babies including twins on board, brothers on board, sisters on board. 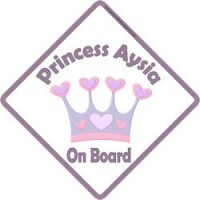 Baby on board signs aimed at young girls, such as little princess on board, ballerina, little angel. 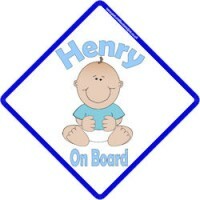 Personalised car signs aimed at young boys, such as mummy's little solider, cheeky monkey on board, cool dude on board. Wolrds best mum, supermum, mum to be on board. These signs make a great mothers day present. Number 1 Dad, worlds best dad, my dad is bigger than your dad. Signs aimed at grandparents and grandchildren. Granny, grandparents on board, granddaughter, grandson on board. Signs aimed at adults, or with adult humour. Beer lover on board, Red wine love on board, I facebooked your mum, My other ride is your dad. Baby on board signs - A bit of history. So where did it all start? Many theories exists behind the baby on board signs. One of the most popular involves a car crash where a child is flung out of the car and buried in a bush / grass / somewhere well hidden, the driver is dead / unconscious and the only way the rescue services knew to look for the child was because of the "baby on board" sign stuck in the window. This is believed to be an urban myth, started many decades ago. A more realistic use for the signs is to promote the idea that children are on board, which you may not be able to see (due to their height) Therefore if you are tailgating and have an accident, rather than just giving the driver whiplash, you could potentially cause much more serious damage to a child in the back. If you had seen a sign - maybe you would have backed off. 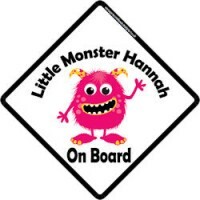 Now days, they have become much more a novelty product, whilst some still have their uses - we have made many signs with "disabled child on board" for children who may appear aggressive at traffic lights to other drivers, a simple sign can put into context their behaviour. Many signs are now given as gifts, as jokes or something to brighten up your car. Personalised car signs have taken a leap forward in recent years, from the classic yellow and black baby on board sign, we can now offer a fully customisable service. You can specify exactly what you want in your signs, the colours, the text, include pictures or photo's. Personalised baby on board signs are very popular again, with cheeky monkey and little princess being two of the most common styles.